This volume is the first to investigate manifestations of faith in the book of Hebrews across four dimensions: ethical, eschatological, Christological, and ecclesiological. 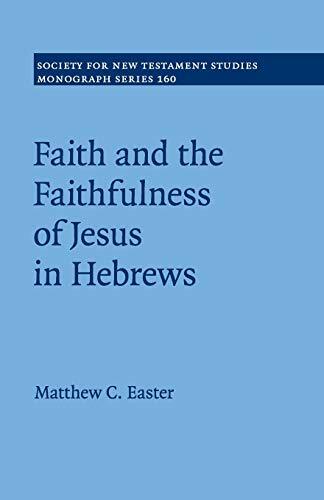 Matthew C. Easter illustrates that two contrasting narrative identities emerge in Hebrews: the author of the epistle proclaims that "we are not of timidity unto destruction, but of faith unto the preservation of the soul" (Hebrews 10:39). Easter classifies the former as the default human story, which lacks faith and results inevitably in death. The latter represents the story of faith, in which one endures suffering to the point of death and thereby achieves eschatological life. The epitome of faithfulness, Jesus confirms the truth of this conclusion and perfects faith through his resurrection. Humans participate in the story of faith by enduring suffering with the traveling people of God and, in doing so, look forward to being raised with Jesus.